A total of 44 (Male – 27 & Female – 17) faculty members attended the conclave representing higher education institutions from southern Indian states. Day 1 The welcome address was delivered by the Vice Chancellor, JSS Science and Technology University, Dr. B.G. Sangameshwara. In his address, he reinforced the need to inculcate the idea of natural resource conservation amongst students, starting right at the primary education levels. Following his speech, the principal, Dr. T Nagabhushan also welcomed the idea of conducting such conclaves, exclusively for educators, at regular intervals. He further added that the issue of environmental crisis is serious and hence it calls for a serious action too. Sunita Narain’s keynote address on the State of Environment reinforced that we are in a situation of environmental crisis and how Extreme has become the new Normal. She also emphasised that the frequency of man-made disasters have increased significantly owing to the mismanagement of local environment, thereby effecting the poorest of the poor. As a takeaway, educators were encouraged to act as multipliers to change the way the young understand environment. The session by Dr. Ashish Verma (representing Centre for infrastructure, Sustainable Transportation & Urban Planning, IISC) stressed the urgent need for a transition towards more sustainable transportation and adaptation measures to break the ‘vicious circle of congestion’. He explained that we cannot ignore the fact that there exists a stark difference in the objectives behind our current transportation policies in comparison to an ideal transportation policy. Our policies aim at moving vehicles instead of moving people, thereby promoting ownership of private vehicles over plying of public transportation. The next speaker, S Vishwanath, an urban planner, spoke about the fast-disappearing ancient and unique wells, rainwater harvesting (as practised in Bengaluru) and the re-use of sewage in Vijaypura to grow mulberry. “India was and is a ground water civilisation”, he said and ‘open wells’ have been a sustainable source of extracting water for household consumption. The culture of open wells, he added is diminishing but we surely need to get back to it to ensure sustainability. The day concluded with an activity-based session facilitated by Bhitush (Water Programme, CSE) based on the mapping of excreta flows for better sanitation planning. This diagram essentially helps in locating the problem area i.e. whether transportation is an issue or waste treatment or disposal is an issue. Day 2 began with a field visit facilitated by Senior Health Officer, Dr.Nagraju of the Mysuru Municipal Corporation and Yadava(residential area) RWA members. The participants witnessed the process of door-to-door segregation. This was followed by a visit to the Decentralised zero waste plant where the educators observed the various categories of segregated waste. At the IL & FS composting plant, the educators got an opportunity to observe the process of aerobic decomposition of the biodegradable waste (as collected each day from the city of Mysuru). The last halt was at the Mysuru landfill site, where waste that cannot be treated or recycled is deposited in huge double lined open pit. Since the educators came from places that did not have such robust waste management systems, there were a number of questions related to economics of sustaining such an operation; health and insurance benefits of the employees involved in the manual segregation, etc. 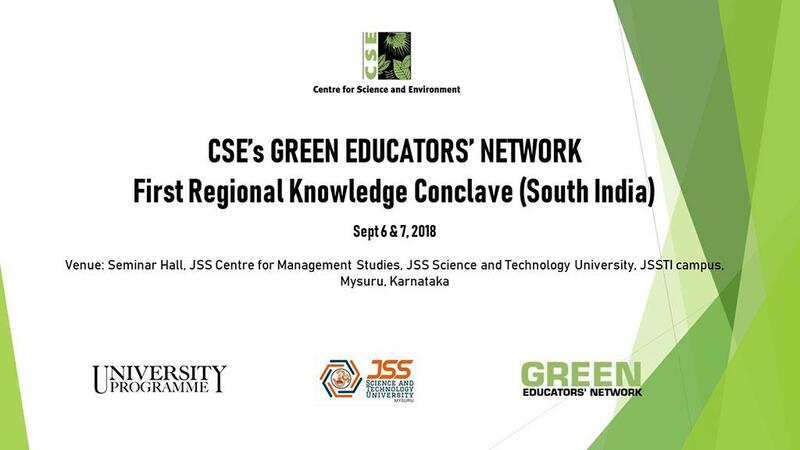 The conclave concluded with a session on Green Campus by Rajneesh Sareen and Sugeet Grover of CSE’s Sustainable Buildings and Habitat Programme.